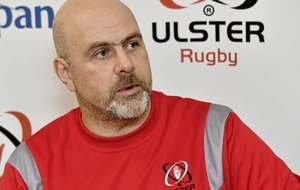 ALL eyes will be on Ulster’s marquee signing Marcell Coetzee when he makes his long-awaited debut in the PRO12 clash with Edinburgh at the Kingspan Stadium, but director of rugby Less Kiss will be more concerned with securing a win over the Scottish side. Ulster are looking to reverse a poor run of results which has seen them pick up just one win across all competitions in their last six games, while the visitors are hoping to complete their first double over the province since the 2007/’08 season. Coetzee, who was signed last summer but has been sidelined with a long-term injury, will play in the number eight position, where Ulster have badly missed Nick Williams since his departure for Cardiff. Kiss’s men will be hoping the former Natal Shark can turn their fortunes around following a spell of modest form, with hopes high of getting their season back on track on home soil. However, Kiss, while delighted at the fact he has the player available at long last, has warned fans not to expect too much from the South African – for the time being at least. “It’s like a new signing and Marcell’s enthusiasm has been fantastic and his approach to training and preparation is first class,” said Kiss. “He is champing at the bit and he certainly has an infectiousness nature about him, he is enthusiastic and he is gunning to go. “It’s important for him to have a good solid game but I don’t think we’ll expect everything from him this weekend. “He needs to just get hands on the ball, get his shoulder into a tackle and start to feel the game again. It’s been a frustrating time for Coetzee as he recovered from a serious knee injury, picked up while playing for the Sharks last April, shortly after his move to Ulster was confirmed. However, the 28-time capped Springbok is likely to be involved in one of the key battles as he goes head-to-head with Edinburgh’s top try-scorer Magnus Bradbury. The Scots’ acting head coach Duncan Hodge says his side, with only one change from last week’s 10-9 defeat by Munster, face a tough test. “As a squad, we were frustrated with last week’s result and know the last 20 minutes of the game let us down,” said Hodge. Munster will be aiming to make it nine consecutive wins when they tackle the Dragons in Cork tonight.